Are you ready to start figuring out how to navigate your need for Katy TX HVAC Contractors? While you may feel like you don’t have any answers to these complicated questions, we’re going to be there for you when you need it the most. For the right solutions to the things that plague you, reach to us here at Houston Admiral Services. 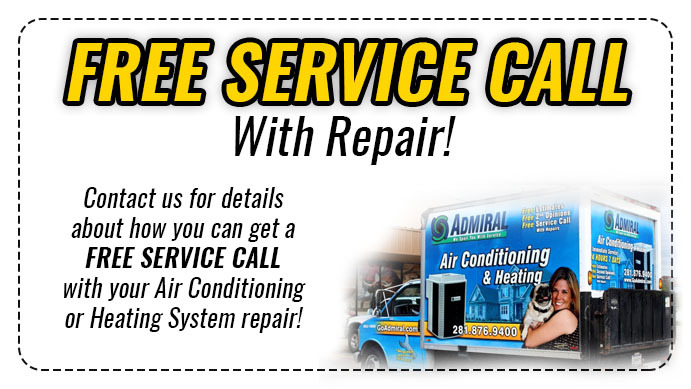 We have a team made up of quality servicemen who can help you figure out your AC needs and situations. Houston Admiral Services is a company that wants you to be able to make the most out of whatever circumstance you’ve put yourself into. Are you trying to figure out how your furnace repair is going to get taken care of? Perhaps you need some emergency air conditioning service but you still haven’t found the right person to do it. While this isn’t something you can usually tackle and navigate by yourself, our team has you covered. Trust in the services we’ve put forth and make the most out of your circumstance. With our Katy TX HVAC services around, you won’t have to worry about not having the professionals you require. We have a bevy of residential services that can help you make the most out of your HVAC systems. Are you ready to start doing things differently regarding your residential and commercial setups, but you don’t know where you’re going to start? If you haven’t figured this out yet and you need some help, it can be very frustrating not knowing where to go. Make sure you’re able to protect your home and keep it in good condition by calling in our team for more information. We’ve got all the protection and services a customer could want, and we’re ready to help you when you need it the most. 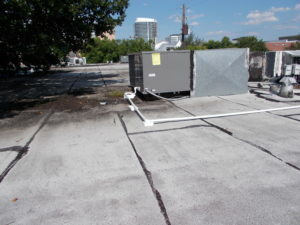 Are you dealing with some commercial problems that are really making your air conditioning units fall apart right before your eyes? Maybe you’re unsure of how you’re going to navigate this and you’d like someone to help you out. While you may feel like you’re not getting the most out of our systems, you’ll be able to count on our team to help you through whatever it is you’re going through. Make sure you’re able to figure out your conundrums and make the most out of your situations by calling in Houston Admiral Services to find your answer. Houston Admiral Services understand the importance of what we do, and we’re going to make sure you have the right answer for what’s going on. Our team of professionals don’t want you to feel as though you don’t have the right resources to save money. We have tons of options, and regardless of your cash flow, we think you’ll be able to realize your potential when you’re around us. Our Katy TX HVAC Service is perfect for you if you’re trying to save some money. Have you already been fascinated by the idea of financing your ac units and now you simply can’t get over it? Maybe you’re trying to make sure your water heater stays good for long. Whatever the case may be, our timely technicians and plumbers are here to figure out what you need. Check out the financing options we’ve graciously posted on our website. Even though we might not have a whole boatload yet, we’re still proud of the creation. Check these out and make sure you save money the next time you shop at your favorite stores! You deserve financing options, and that’s exactly what we’re going to offer you. Are you trying to make sure you’re able to get to the bottom of your AC finance needs? If you want something that’s going to keep you steady and straight for the long run, we think our FTL Financing Leasing options are perfect for you. This will keep your monthly payment the same while locking everything else, too. Financing doesn’t have to be scary; we make it easy, and fun. Not sure what type of person you want to be? If you’re trying to find yourself and really find out what’s inside of you, we can help. By joining Houston Admiral Services, you’ll be able to experience high quality services for the right prices. We’re incredibly proud of the community we’ve built up, and we think we’re not the only ones. If you consider supporting what we do, please do so! Our Katy TX HVAC Contractors options are perfect for you if you’re trying to make sure you have quality air conditioning and heating performance. Houston Admiral Services is a business that can help your residential and commercial problems go away for good. If you’d like some more information on what to do about your HVAC needs, contact us today at 281-876-9400. We’re ready to provide you with some additional details on what needs to happen with your setups and predicaments. 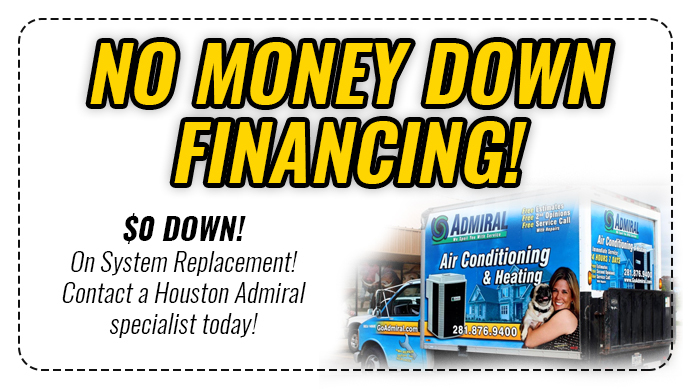 For the best servicemen in Katy, call the Admiral. Are you looking for a place near Clutch City to live, but you don’t want to be embedded in Downtown Houston? If this is what you’re looking for, Katy is the place for you. This is part of the great Houston-Sugar Land-The Woodlands metropolitan area. You’ll greatly enjoy implementing this as part as your family’s identity. Old Towne Katy was one of our first names. In the 19th century, this region was very popular for its settlements, cattle training, and other types of trading and bartering. In recent years, we have grown into a much more metropolitan community that embraces new residents and commercial opportunities. Are you familiar with The Energy Corridor? If you’re trying to make sure you have access to what’s going on with your Katy TX home, we have one of the best commercial areas in the land. Visit Katy, Texas if you’re trying to figure out how you get the most out of your living arrangements!